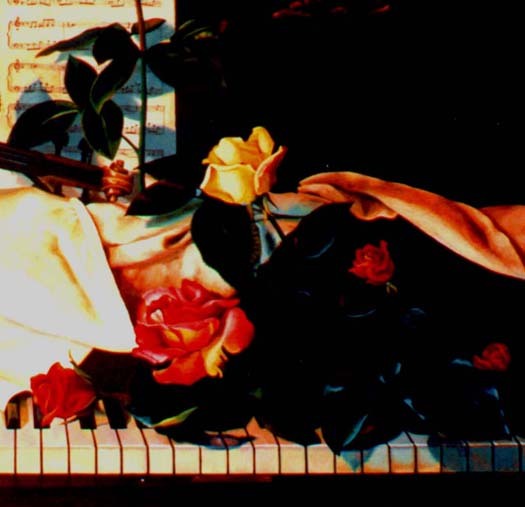 A detail of painting “Colour My World: features roses on a piano with music and a violin. With the economic pressures we have experienced nationally the past few years and the constant rhetoric regarding budget cuts we often hear about art programs being cut in our educational systems. Art and music are not seen as important as the math and sciences, for example. I believe this mindset is short-sighted for some substantial reasons. At the top of the list would be that a serious education in the arts helps develop the mind in the area of problem-solving. How the world needs more problem-solvers! We need people who can look at complex issues and strategize with new ideas and angles to bring about needed solutions! What light source is used, and from what direction comes the light? How the light affects the object(s) in the painting? How does one create a composition that causes the eye to travel all over the canvas? How does one use both variety for interest and also create a unified image? What does the artist want to communicate and what visual clues does he or she use to do so? The arts are a part of what make us human. Of all the species that inhabit the earth, It is human beings alone that do things like build bridges, compose symphonies, build hospitals, send missionaries on mercy relief missions, paint masterpieces, author books (and blogs! ), pen dramas and animate films that resonate with masses of people. The arts impact the culture. A serious education in the arts has many facets that add meaning to life. We create because we were made in the image of God. As part of His creative nature He blessed human beings with the intellect, talent and ability to learn to use this aspect of our nature for positive purposes. Let’s not short change the next generation of the opportunity to learn great time-tested lessons from the arts! ← Painting to Celebrate The Most Joyous Occasion on Planet Earth!